Brighten your smile with laser teeth whitening. Make that first impression a more memorable one with a whiter, more youthful smile. Are you happy with your smile? More then likely, you are not the only one who has started to notice that your smile isn't as bright as it used to be. Factors such as aging, drinking coffee, colas, red wine, smoking and certain medications all play a role in the internal and external shade of your teeth. This usually results in a dull and less attractive smile. That's where Jane Street Dental can help you with in office Zoom Laser Whitening or take-home whitening systems. At home tooth whitening systems require two appointments. The first one will be to make impressions of your teeth and customized trays will be made to fit over your teeth. Next, you return to receive your trays, professional whitening gel and instructions. A drop of gel is placed on each tooth on the tray and the trays are worn for one hour each day until the gel is finished. Dramatic results will appear within one week, however, you will notice change each day they are used. The entire process takes approximately two to three weeks, leaving you with brilliant results everyone will notice! Are you ready for a dramatic change in your appearance? You may be a perfect candidate for our in office Zoom Whitening System. 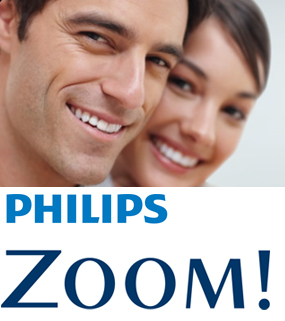 Zoom provides instant results that can dramatically brighten and improve the appearance of your teeth. In clinical research, Zoom Tooth Whitening surpassed all other whitening products. Results were dramatic while minimal sensitivity was experienced. No trays or weeks of dedication to see results, just one hour and you walk out of the office smiling with renewed self confidence. Our Toronto patients are thrilled with the dramatic and immediate results.